New Delhi: Saturday night in the Capital witnessed historic events in more ways than one as The Sufi Route, a concert for peace, was held at the Qutub Minar, one of the most iconic monuments of India. Curated by Friday Filmworks, INvision Entertainment and Invloed Matrix, The Sufi Route left scores of attendees enthralled by Sufi music and dance performances. It was one of its kind first ever successful Sufi concert in India. The artists comprised the legendary AR Rahman, lyricist Javed Akhtar, Nooran Sisters, Hans Raj Hans, Mukhtiar Ali, Kamna Prasad Sood, Fouzia & Firoz, Dhruv Sangari, Whirling Dervish ceremony from Turkey and an Israel artist. Conceptualized as the first of many steps to spread the charm of Sufi poetry the world over, The Sufi Route’s debut edition was as much about peace and inclusion. By partnering with Nobel Peace Prize winner Kailash Satyarthi’s Children’s Foundation for the ‘100 Million for 100 Million – A Billion Acts for Peace’ campaign, the promoters of the concert will help the Foundation connect with a wider audience and create awareness about their projects. It is a five-year journey towards peace and Sufi route is also looking out for global sponsors and partners. In another first, the concert became the first of its kind in India to have given first-hand experience of a live music event to hearing impaired students from Centrum-GRO, an advanced skill training center for the deaf. The celebration moved to music with the splendid performance of Mukhtiar Ali, from the 26th generation of the Sufi singers who performed on “Al – Kabir” along with other songs. Following him, the Nooran Sisters showcased their well-rooted linguistic and musical traditions through their songs like Sayoni, Allah Ho Fakira Di, Main yaar mangda bas pyar mangda. 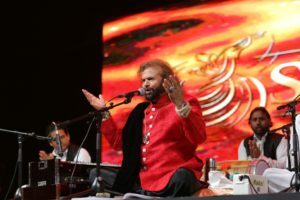 Padmashri awardee Hans Raj Hans performed some of the popular tracks like Duma Dum Mast Kalandar, Nit Khair Maangda, Ishq di gali wichon koi koi laangda from the movie Kacche Dhage. And with the music, the dance of the Whirling Dervish troupe from Turkey which showcased Sufi culture spanning eight centuries added to the magical vibe. Qawwali and classical maestro Dhruv Sangari too made it a memorable evening with Kab Mori Nayya Paar karo tum, Chhaap Tilak Sab Chheeni Re and many more. That said, the one performer whom hundreds of music lovers from across Delhi had braved the smog for, A R Rahman, truly took the concert to a celestial level. 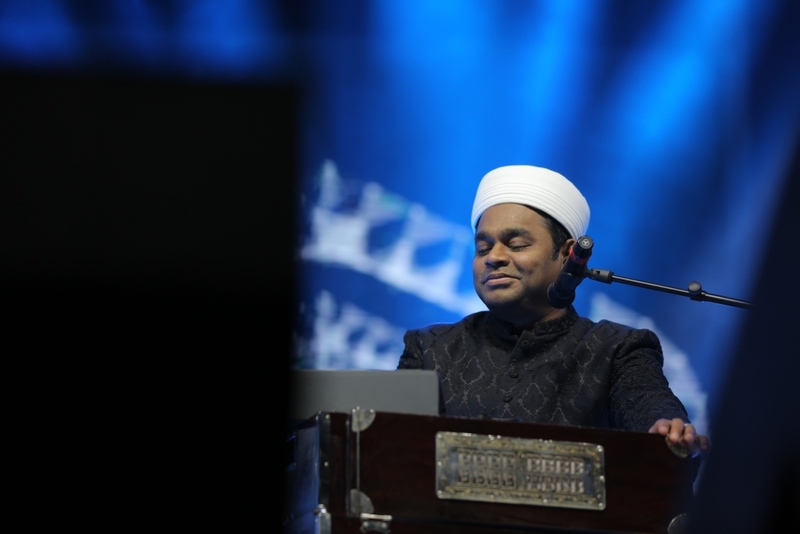 Rahman, a proud exponent of Sufi music, plunged in to the evening with his soulful renditions of Kun Faya Kun, Allah Huma Salle Alla, , Arziyaan Sari Main, Phool Khile Baagiyan and many more. The evening was made even special by the performance of A R Rahman’s son who is following the footsteps of his father. Sana from Israel, who is a Palestinian with two passports, also performed along with Rahman. The Sufi Route is an initiative by Friday Music Project Pvt Ltd, INvision Entertainment Pvt Ltd, and Invloed Matrix. It is supported by Andaz Delhi as Hospitality Partner, Insider. in and Paytm as Ticketing Partners, Harman Pro India Pvt Ltd as Technical Partner, Picture Time Digiplex Pvt Ltd as Digiplex Partner, OneDigital Entertainment as Digital Partner, Scoop Brand Holdings Pvt Ltd as Production Partner, and PVR Cinemas as Multiplex Partner.